Christchurch (Māori: Ōtautahi) is the largest city in the South Island of New Zealand, and the country's second-largest urban area. It is one third the way down the South Island's east coast, just north of Banks Peninsula which itself, since 2006, lies within the formal limits of Christchurch. The city was named by the Canterbury Association, which settled the surrounding province of Canterbury. 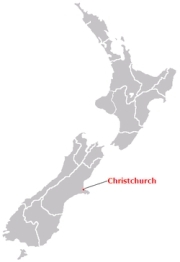 The name of Christchurch was agreed on at the first meeting of the association on 27 March 1848. It was suggested by John Robert Godley, who had attended Christ Church, Oxford. 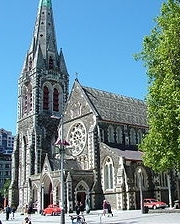 Some early writers called the town Christ Church, but it was recorded as Christchurch in the minutes of the management committee of the association. The usual Māori name for Christchurch is Ōtautahi ("the place of Tautahi"). This was originally the name of a specific site by the Avon River near present-day Kilmore Street and the Christchurch Central Fire Station. The site was a seasonal dwelling of Ngāi Tahu chief Te Potiki Tautahi, whose main home was Port Levy on Banks Peninsula. The Ōtautahi name was adopted in the 1930s. Prior to that the Ngāi Tahu generally referred to the Christchurch area as Karaitiana, a transliteration of the English name. 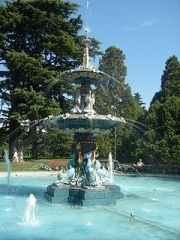 Christchurch lies in Canterbury, near the centre of the east coast of the South Island, east of the Canterbury Plains. It is located near the southern end of Pegasus Bay, and is bounded to the east by the Pacific Ocean coast and the estuary of the Avon as well as the Heathcote River. 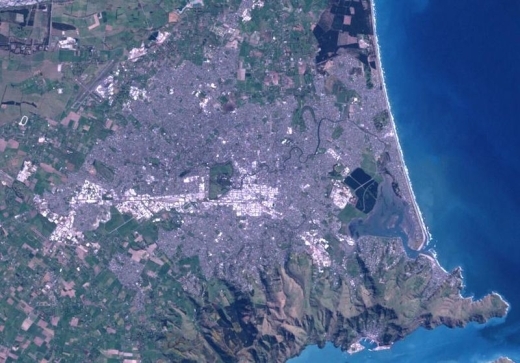 To the south and south-east the urban portion of the city is limited by the volcanic slopes of the Port Hills separating it from the Banks Peninsula. As of 2006, the Banks Peninsula was incorporated into the city, in effect tripling the city's land area while adding only about 8,000 people to the city's population. To the north the city is bounded by the braided Waimakariri River. Christchurch is one of the few cities in the world that has a near-exact antipodal city – A Coruña in northwestern Spain. Christchurch has one of the highest-quality water supplies in the world, rated one of the purest and cleanest water in the world. The water is sourced via more than 50 pumping stations from aquifers which conduct it from the foothills of the Southern Alps and provide natural filtering. At the centre of the city is Cathedral Square, surrounding the Anglican cathedral, Christ Church. The area around this square and within the "four avenues" of Christchurch (Bealey Avenue, Fitzgerald Avenue, Moorhouse Avenue and Deans Avenue is considered the central business district of the city. The central city also has a number of residential areas, including Inner City East, Inner City West, Avon Loop, Moa & Victoria. 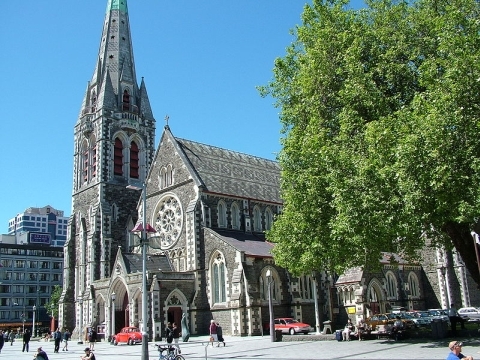 Cathedral Square is a popular destination and hosts attractions such as the speakers' corner made famous by the Wizard of New Zealand, Ian Brackenbury Channell, and evangelist Ray Comfort. 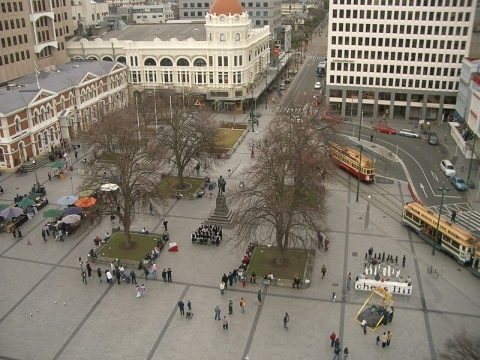 The central city includes the pedestrianised Cashel Street as Christchurch's urban mall. At one end of the mall stands the Bridge Of Remembrance; at the other end the amphitheatre known as the Hack Circle. The Cultural Precinct provides a backdrop to a vibrant scene of everchanging arts, cultural, and heritage attractions within an area of less than one square kilometre. The majority of the activities are free and a printable map is provided. Mairehau; Shirley; Dallington; Richmond; Avonside; Linwood; Woolston; Opawa; Waltham; St Martins; Beckenham; Sydenham; Somerfield; Spreydon; Addington; Riccarton; Ilam; Burnside; Fendalton; Bryndwr; Strowan; Merivale; Papanui; St Albans. Christchurch has a dry, temperate climate, with mean daily maximum air temperatures of 22.5°C (72.5°F) in January, 11.3°C (52.3°F) in July. The summer climate is often moderated by a sea breeze from the Northeast, but a record temperature of 41.6°C (107°F) was reached in February 1973. A notable feature of the weather is the nor'wester, a hot föhn wind that occasionally reaches storm force, causing widespread minor damage to property. In winter it is common for the temperature to fall below 0°C (32°F) at night. There are on average 70 days of ground frost per year. Snow falls occur on average once or twice a year in the hill suburbs and about once or twice every two years on the plain. On cold winter nights, the surrounding hills, clear skies, and frosty calm conditions often combine to form a stable inversion layer above the city that traps vehicle exhausts and smoke from domestic fires to cause smog. While not as bad as smog in Los Angeles or Mexico City, Christchurch smog has often exceeded World Health Organisation recommendations for air pollution. The city has funding available to upgrade domestic home heating systems, and in order to limit air pollution has banned the use of open fires as of 1 January 2006. As of 2008, woodburners more than 15 years old are prohibited. 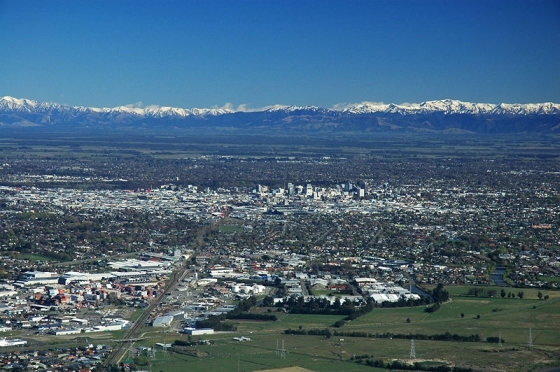 The area administered by the Christchurch City Council has a population of 368,900 (June 2008 estimate), making it the second-largest in New Zealand, and the largest city in the South Island. The Christchurch urban area is the second-largest in the country by population, after Auckland. The agricultural industry has always been the economic core of Christchurch. The city has long had industry based on the surrounding farming country. PGG Wrightson, New Zealand's leading agribusiness, is based in Christchurch. Its local roots go back to Pyne Gould Guinness an old stock and station agency serving the South Island. That firm helped take deer farming techniques abroad. PGG Wrightson's overseas diversification includes dairy farming in Uruguay. Other agribusineses in Christchurch have included malting, seed development and dressing, wool and meat processing, and small biotechnology operations using byproducts from meat works. Dairying has grown strongly in the surrounding areas with high world prices for milk products and the use of irrigation to lift grass growth on dry land. With its higher labour use this has helped stop declines in rural population. Many cropping and sheep farms have been converted to dairying. Conversions have been by agribusiness companies as well as by farmers, many of whom have moved south from North Island dairying strongholds such as Taranaki and the Waikato. Cropping has always been important in the surrounding countryside. Wheat and barley and various strains of clover and other grasses for seed exporting have been the main crops. These have all created processing businesses in Christchurch. In recent years, regional agriculture has diversified, with a thriving wine industry springing up at Waipara, and beginnings of new horticulture industries such as olive production and processing. Deer farming has led to new processing using antlers for Asian medicine and aphrodisiacs. The high quality local wine in particular has increased the appeal of Canterbury and Christchurch to tourists. In earlier years, Christchurch was one of the two heavy-engineering centres of New Zealand, with firms such as Anderson's making steel work for bridges, tunnels, and hydro-electric dams in the early days of infrastructure work. Now manufacturing is mainly of light products and the key market is Australia, with firms such as those pioneered by the Stewart family among the larger employers. Before clothing manufacture largely moved to Asia, Christchurch was the centre of the New Zealand clothing industry, with firms such as LWR Industries. The firms that remain mostly design and market, and manufacture in Asia. The city also had five footwear manufacturers, but these have been replaced by imports. In the last few decades, technology-based industries have sprung up in Christchurch. Angus Tait founded Tait Electronics, a mobile-radio manufacturer, and other firms spun off from this, such as Dennis Chapman's Swichtec. In software, Gil Simpson founded LINC, which became Jade. Neither Angus nor Gil completed high school education. However, there have been spin-offs from the electrical department of the University of Canterbury engineering school. These included Pulse Data, which became Human Ware (making reading devices and computers for blind people and those with limited vision) and CES Communications (encryption). The Pulse Data founders had moved from the Canterbury University engineering school to work for Wormald when they set up Pulse Data through a management buyout of their division. Nowadays, the University of Canterbury engineering school and computer science department play an important role in supplying staff and research for the technology industries, and the Christchurch Polytechnic Institute of Technology provides a flow of trained technicians and engineers. Similarly, nearby Lincoln University has played an important role in Christchurch agribusiness. Tourism is also a significant factor of the local economy. The closeness of the ski-fields and other attractions of the Southern Alps, and hotels, a casino, and an airport that meet international standards make Christchurch a stopover destination for many tourists. The city is popular with Japanese tourists, with signage around Cathedral Square in Japanese. 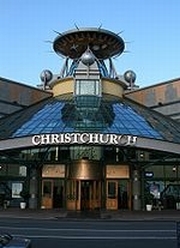 Christchurch is served by Christchurch International Airport and by buses (local and long-distance) and trains. The local bus service, known as Metro, is provided by Environment Canterbury. The car, however, remains the dominant form of transport. The central city has very flat terrain and the City Council are establishing a network of cycle lanes on roads. 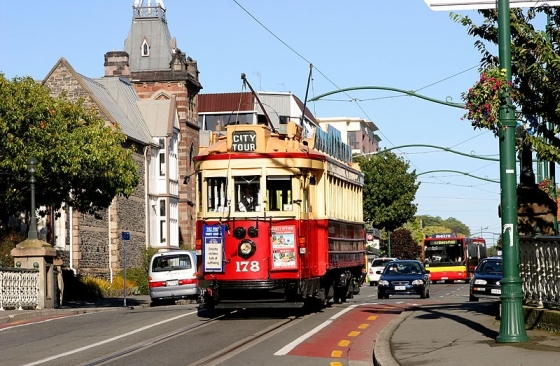 There is a functioning tram service in Christchurch, but as a tourist attraction, its loop is restricted to a circuit of the central city. The trams were originally introduced in 1905, ceased operating in 1954, but returned to the inner city (as a tourist attraction) in 1995. In addition to normal bus services, Christchurch also has a pioneering zero-fare hybrid bus service, the Shuttle, in the inner city. The Main North Line railway travels northwards via Kaikoura to Picton and is served by the famous TranzCoastal passenger train, while the Main South Line heads to Invercargill via Dunedin and was used by the Southerner until its cancellation in 2002. The most famous train to depart Christchurch is the TranzAlpine, which travels along the Main South Line to Rolleston and then turns onto the Midland Line, passes through the Southern Alps via the Otira Tunnel, and terminates in Greymouth on the West Coast. This trip is often regarded to be one of the ten great train journeys in the world for the amazing scenery through which it passes. The TranzAlpine service is primarily a tourist service and carries no significant commuter traffic. Commuter trains used to operate in Christchurch but were progressively cancelled in the 1960s and 1970s. The last such service, between Christchurch and Rangiora, ceased in 1976. Archeological evidence found in a cave at Redcliffs in 1876 has indicated that the Christchurch area was first settled by moa-hunting tribes about 1250. 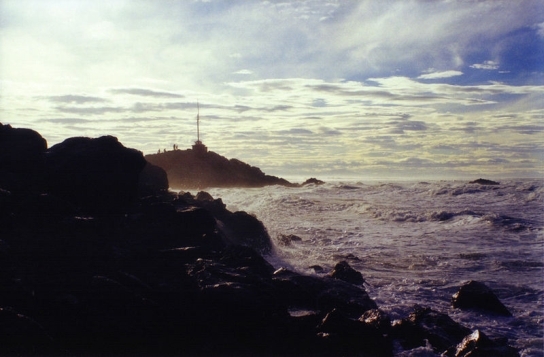 Māori oral history relates that humans occupied the area around the year 1000. These first inhabitants were thought to have been followed by the Waitaha tribe, who are said to have migrated from the East coast of the North Island in the 16th century. Following tribal warfare, the Waitaha (made of three peoples) were dispossessed by the Ngāti Mamoe tribe. They were in turn subjugated by the Ngāi Tahu tribe, who remained in control until the arrival of European settlers. Following the purchase of land at Putaringamotu (modern Riccarton) by the Weller brothers whalers of Otago and Sydney a party of European settlers led by Herriott and McGillivray established themselves in what is now Christchurch, early in 1840. Their abandoned holdings were taken over by the Deans brothers in 1843 who stayed. The First Four Ships were chartered by the Canterbury Association and arrived on 16 December 1850, bringing the first 792 of the Canterbury Pilgrims to Lyttelton Harbour. These sailing vessels were the Randolph, Charlotte-Jane, Sir George Seymour, and Cressy. The Canterbury Pilgrims had aspirations of building a city around a cathedral and college, on the model of Christ Church in Oxford. The name "Christ Church" was decided prior to the ships' arrival, at the Association's first meeting, on 27 March 1848. Captain Joseph Thomas, the Canterbury Association's Chief Surveyor, surveyed the surrounding area. By December 1849 he had commissioned the construction of a road from Port Cooper, later Lyttelton, to Christchurch via Sumner. However this proved more difficult than expected and road construction was stopped while a steep foot and pack horse track was constructed over the hill between the port and the Heathcote valley, where access to the site of the proposed settlement could be gained. This track became known as the Bridle Path, because the path was so steep that pack horses needed to be led by the bridle. The Anglican cathedral was completed in 1904 and has since been the focal point of the city. Goods that were too heavy or bulky to be transported by pack horse over the Bridle Path were shipped by small sailing vessels some eight miles (13 km) by water around the coast and up the estuary to Ferrymead. New Zealand's first public railway line, the Ferrymead railway, opened from Ferrymead to Christchurch in 1863. Due to the difficulties in travelling over the Port Hills and the dangers associated with shipping navigating the Sumner bar, a railway tunnel was bored through the Port Hills to Lyttelton, opening in 1867. Christchurch became a city by Royal Charter on 31 July 1856, the first in New Zealand. Many of the city's Gothic buildings by architect Benjamin Mountfort date from this period. Christchurch was the seat of provincial administration for the Province of Canterbury, which was abolished in 1876. Christchurch was also host to the 1974 British Commonwealth Games. Christchurch has a history of involvement in Antarctic exploration – both Robert Falcon Scott and Ernest Shackleton used the port of Lyttelton as a departure point for expeditions, and there is a statue of Scott, sculpted by his widow, Kathleen Scott, in the central city. 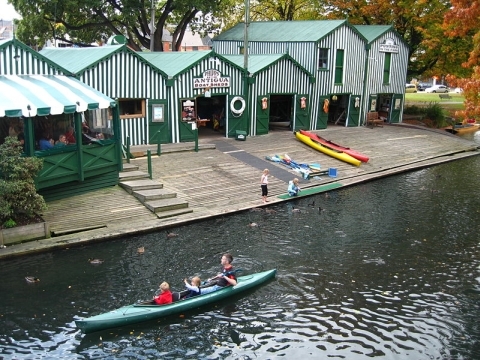 Within the city the Canterbury Museum preserves and exhibits many historic artifacts and stories of Antarctic exploration. Christchurch International Airport serves as the major base for the Italian and United States Antarctic programs as well as the New Zealand Antarctic programme. The International Antarctic Centre provides both base facilities and a museum and visitor centre focused upon current Antarctic activities. The United States Navy and latterly the United States Air National Guard, augmented by the New Zealand and Australian air forces, use Christchurch Airport as take-off for the main supply route to McMurdo and Scott Bases in Antarctica. The Clothing Distribution Centre (CDC) in Christchurch, has more than 140,000 pieces of extreme cold weather (ECW) gear for issue to nearly 2,000 U.S. Antarctic Program (USAP) participants in the 2007-08 season. Water fountain at Christchurch Botanical Gardens. * Christ Church (the Anglican cathedral), the centre of the Church of England settlement was built between 1864 and 1910. * The Roman Catholic Cathedral of the Blessed Sacrament, consecrated in 1905, is widely considered to be the finest renaissance-style building in Australasia. * Christchurch Art Gallery (A new gallery opened 2003 to replace the 1930 Robert McDougall Art Gallery situated in the Botanic Gardens). * The Christchurch Arts Centre, formerly Canterbury College and the site of "Ernest Rutherford's Den". * The Provincial Council Chambers, 1857–1865. * The Timeball Station in Lyttelton. * The New Brighton pier. * The Summit Road along the top of the Port Hills and Godley Head Road provides numerous spectacular views of the area and features the buildings created as wayside rests, the Sign of the Takahe (now a function centre) and Sign of the Kiwi. The Mt Pleasant Trig offers 360° views from Lyttelton Harbour back over the hills to the southern alps and the city, and out over Pegasus Bay. * Walkways including Victoria Park, the Bridle Path and Whitewash Head, a bird sanctuary. * There is a large nesting colony of spotted shags immediately south of Christchurch. The large number of public parks and well-developed residential gardens with many trees has given Christchurch the name of The Garden City. Hagley Park and the 30-hectare (75 acre) Christchurch Botanic Gardens, founded in 1863, are in the central city, with Hagley Park being a site for sports such as golf, cricket, netball, and rugby, and for open air concerts by local bands and orchestras. To the north of the city is the Willowbank wildlife park. Travis Wetland, an ecological restoration programme to create a wetland, is to the east of the city centre in the suburb of Burwood. The Westpac Arena is New Zealand's second largest permanent multipurpose arena, seating between 5000 and 8000, depending on configuration. It is home of the Canterbury Tactix netball side. 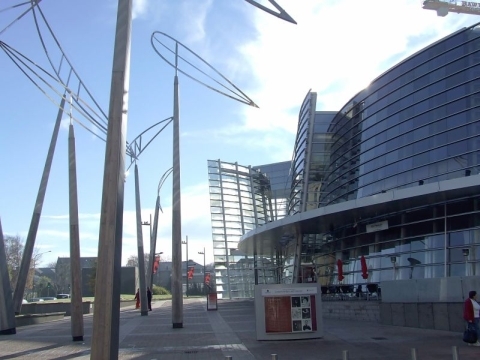 It was the venue for the 1999 World Netball championships and has been host to many concerts in recent years. The Christchurch Town Hall Auditorium (2500 seats, opened 1972) was the first major auditorium design by architects Warren and Mahoney and acousticians Marshall Day. It is still recognised as a model example of concert-hall design. It has an excellent modern pipe organ. Christchurch also has a Casino, and there are also a wide range of live music venues – some short-lived, others with decades of history. Classical music concerts are held at the Music Centre. Christchurch has seven sister cities around the world.